Two more bicyclists in the collection. 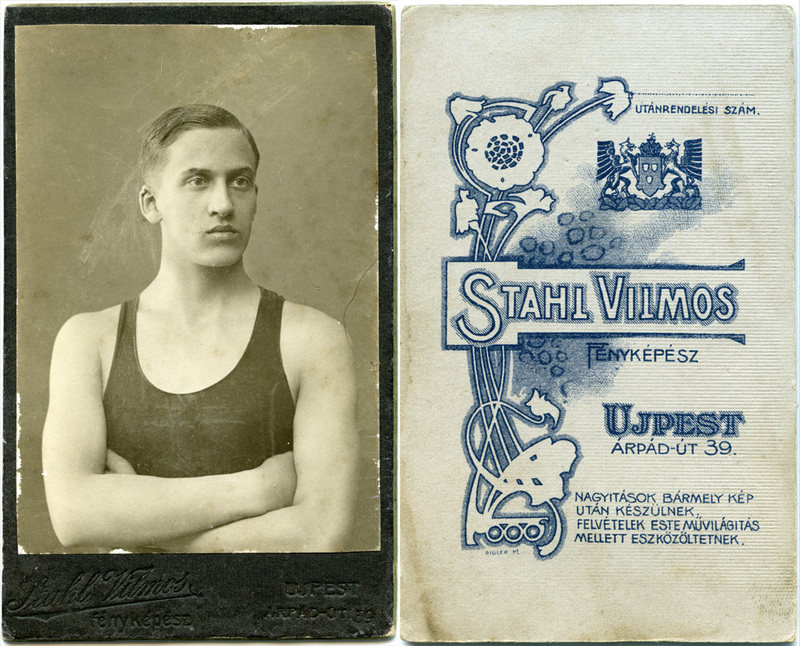 Both from the same time period – turn of the 20th century. One is a bike messenger, the other a competitive cyclist. Notice the difference in the handlebars of the bikes- the messenger has fairly traditional straight-across handlebars whereas the racing bike has proto- drop handlebars like we see on modern racing bikes. I love the racing cyclist’s cap – it’s the little details that make the image with these kinds of photos. Here’s an interesting one, a portrait of an athlete, but it doesn’t show anything to indicate what sport he partakes in. Love all three but particularly the Toledo one. He looks a lot more contemporary than one would expect in a photo of this era. 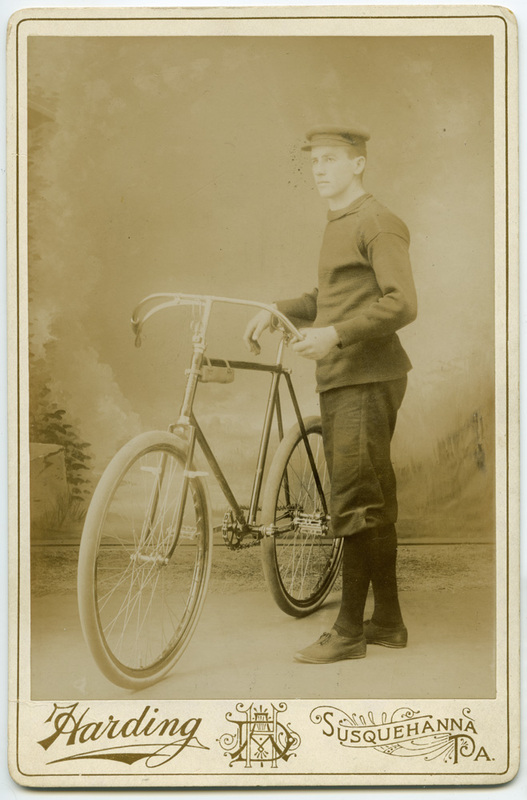 Apparently many photographers at this time had bicycle (or at least one) in their studios to use in posed shots of this type. 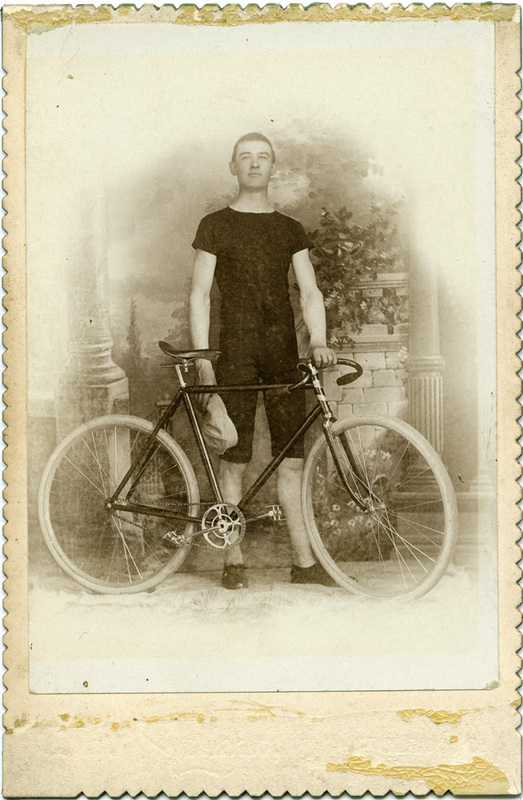 The racer’s bicycle looks as if it could be his, judging by his leg length and the height of the seat, but overall it looks a little small. The messenger’s bicycle seems less likely to be his – it is so tall, his arm is bent in order put his forearm on the seat. While kids who don’t have access to kid-size cycles can ride bicycles that have top tubes well above their crotch, few adults would want to do that since they have choices typically that are appropriately sized. An interesting feature of this bike is that it has two flanges on the fork for the rider to put his feet while coasting, since this would be a “fixie” without an ability for the rear wheel to freewheel – when the rear wheel turns, the pedals turn. Not a feature a messenger would be too interested in. And finally, to prove just how pedantic I can be – the gearing isn’t right for a messenger bike – it wouldn’t allow enough speed. Nice photo, and nice bike, though! Cheers. Thanks for the feedback! I’m by no means a bike expert and wouldn’t have known to look for such details. It makes the pictures even more meaningful, even if it does call into question the story the picture purports to tell. That’s exactly the kind of thing I find so fascinating, and in a subtle way shows how photography was never really about telling the truth. It was about creating and projecting a public image. The everyman’s equivalent of the heroic statue that added six inches, took off twenty pounds and twenty years, and portrayed the sitter as a commanding general when in fact the only thing he’d ever commanded was the buffet line.